In response to Ecuador Earthquake, we would like to extend the heartfelt sympathy and condolences to the people of Ecuador over the serious earthquake. We pray for all of the people in the affected area. 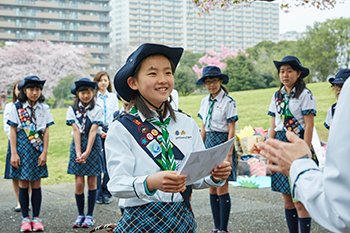 Girl Scouts of Japan would like to express our sincere appreciation for all your warm sympathy and prayers from the world regarding the recent earthquake in the south part of Japan. We are working to understand the situation, and we have confirmed that all Girl Scout members are alive in the affected areas. However, there have been hundreds of aftershocks and the situation is changing. Girl Scouts of Japan will keep working and consider how and what we can support the affected area cooperating with our Local Councils.